You are here: Home / Real Estate / Bangalore Real Estate / How to get Property Encumbrance Certificate online in Karnataka? Buying a property (home/plot/land) is one of the most important decisions that you will ever make. Buying a property involves a lot of money and it is a serious money decision. When buying a property, due diligence is essential and you have to verify a lot of property documents. One of the important documents that you need to apply and verify is an Encumbrance Certificate or popularly known as the EC. The Dept of Stamps & Registration of Govt of Karnataka is officially going to launch online Property registration & other services very soon. A slew of services, under the umbrella of Kaveri Online Services are available online. The citizens can now book slots for property registration in advance online. The government has also made encumbrance certificates (ECs) online. The State’s Stamp & Registration department has digitized records from 2003 onward, which means property buyers will be able to virtually access digitally-signed encumbrance details for a property since then. In this post, let us understand – What is EC (Encumbrance Certificate)? How to apply for Karnataka Property Encumbrance Certificate online? What is the procedure to get EC online for the properties in Bangalore, Karnataka? Is it possible to get digitally signed copy (certified copy) of EC online? – Let’s discuss…. How to get Encumbrance Certificate online in Karnataka? Kindly visit Kaveri online services portal. You need to register as a ‘new user’ to get EC online. Click on ‘Register as New User’ option under Login section of the portal. 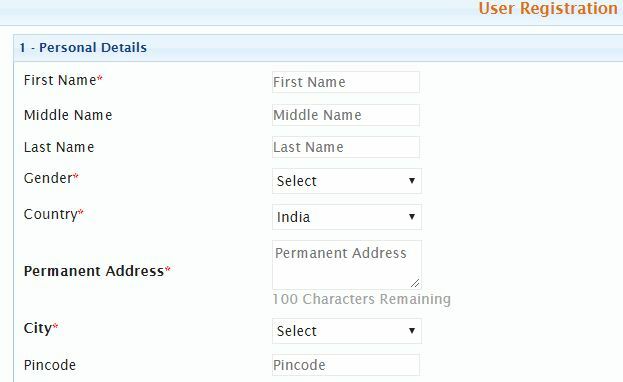 You need to provide your personal details like Name, Date of Birth, Address, PAN, Mobile number, Email Id etc., and click on ‘Register’ button. An activation code is sent to your email Id. You will also receive an SMS with same activation code and also password to login. Kindly key in the code and click on ‘Activate’ button. You can login with the credentials and change the password. 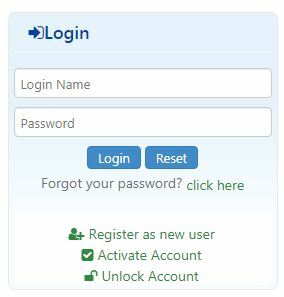 After login to the portal with your login name and password, click on ‘Online EC’ under ‘Services’ section. You have to select the duration range for EC (details are available from 2004 onwards) and provide the Property details as given in the concerned Sale Deed document. You also have to provide Property Boundary details to get EC online. Check ‘Send OTP to view Document’ option. An OTP is sent to your registered mobile number. You have to key-in that OTP to view/download Property Encumbrance Certificate online. Click on ‘View Document’ to download or print the required EC certificate. Kindly note that the EC document which is generated is for information purposes only and it is free-of-cost. But, it is not a digitally signed certified copy. In case, you would like to download a certified copy of Encumbrance Certificate, select the option ‘Check to apply for digitally signed EC’ option after providing the OTP and then click on ‘View Document’. Click on ‘Proceed’ option at the end of the online PDF document and pay the required fees. An online payment receipt gets generated. 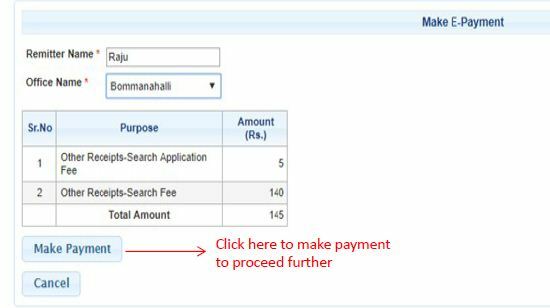 You can now click on ‘Refresh Payment status’. 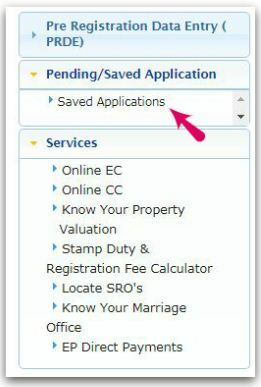 Your online EC application gets submitted and saved under ‘Pending / Saved Application’ section for further processing. Your application for EC will be sent to the concerned authorities and will be digitally signed. You can track the status of your EC application online (select ‘online EC application’ option under ‘Service type’ from the list) and can download the signed & Certified copy of EC once it is available online. Following are the steps as given in the portal to download or apply for EC online. How to get Property EC offline? To obtain EC offline, you need to submit Form No. 22 (application for EC). Personally, I have observed that in most of the property deals, it is either the financial institution or a real estate agent or an agent at SRO who applies for an EC. Most of the times, the agents charge EXTRA amount to get the EC for you within 24 hours 🙂 . 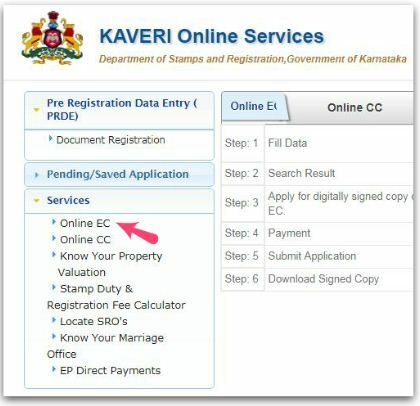 Besides online EC service, you can also avail other services like online Certified Copy of Sale Deed/Registration document, prior appointment for Property registration facility etc., by visiting Kaveri portal. Thank you for the steps provided to view/obtain EC. I tried the above steps to view EC by giving the correct details as mentioned in sale deed but I’m getting a Nil encumbrance certificate only. FYI I have encumbrance certificate for the same site but via online I’m not able to view. Kindly help how to go forward. You may try with difference combinations of property details (based on the details given in the Sale deed) to get the online EC. Hi Sreekanth, i need some information regarding online EC. Possible to share you email? 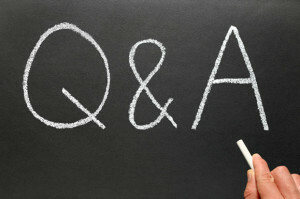 I provide suggestions through my blog/Forum only. Apologies! hi what are the different property types and when i select survey number it doesnt show any details, but if i choose katha number it shows results. For an apartment which property type should be used to get the results for only that apartment? Hi Sreekanth, Good Evening. I have applied EC online thru Kaveri online service on Feb 4th 2019 and followed the procedures as stated above. I also paid the prescribed fee thru online. but i did not get the E-signed EC till date. May i know usually how many days the dept took to process / issue the E-signed EC. Officially, the time taken to get EC statement is around 10 to 30 days. Hi Sreekanth, Good Morning. I applied EC and followed the procedures as stated above. now it showing EC prepared and uploaded. Whereas there is no link nor not able to view the EC? is it any issue or still I have to wait to get the link. You may kindly wait for couple of days and check again.. Thanks Sreekanth for the info. Today,I had applied for online EC and paid the prescribed fee how ever was unable to get any link to download. I thought of raising complaint but your site helped me to locate the information where i can see the status of application. Bit relaxed now. I am waiting for them to upload the document. I tried this Kaveri portal for my Flat. 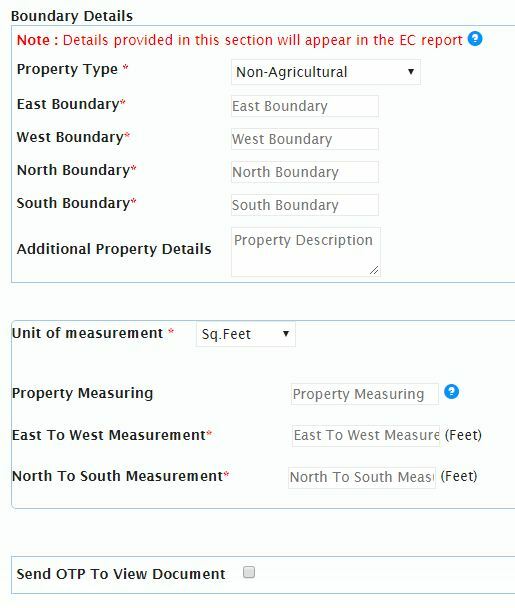 Under property details, I see multiple options, I tried Survey no, PID no etc and also tried survey no and flat no together but still no luck. It shows blank. All details I took from sale deed. Any help? Thanks for the Article Sreekanth. Are these online services really work as per expectation or Registrar office doesn’t give priority to online application ? Have you come across anyone getting their registration done using online services? As of now, I didn’t come across anyone getting the online registration done. I dont think the entire Registration process is offered via online, it is just that you can book ‘prior appointment’ through online for the Registration of your Document at the concerned Sub-Registrar office. Hi..You may have to wait for few days and once they upload it, can download it..
Did you get your document and did they ask for “Unofficial Fee” for same ? EVen i am planning to get my flat registered but not sure whether to get it done offline or online. I have completed all above steps, but can’t see download option. Could you pl help to share the steps to download EC after making the payment (I did rcv a sms from portal saying that signed EC is uploaded). Mostly, the dept might not yet uploaded the signed copy, you may wait for sometime and then try. Thanks Sir. It is working now. Thanks for the information sir, it’s really a nice article. 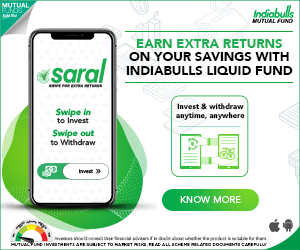 Is EC Online on Kaveri Online working really? Above screen shot shows that there is empty in both sellilng party and buying party in addition to property details. I also got the same online same as above with everything empty. Looks like it is not working??? can you plz confirm? Yes, the online facility is working fine. You need to give the required (correct) details to get the EC online. You are welcome dear Ajay… Keep visiting ReLakhs.com !